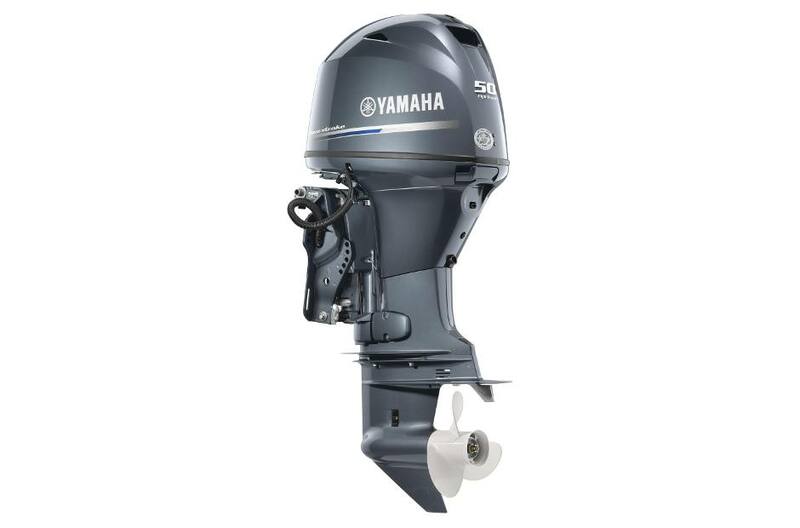 New 2016 Yamaha T50LB four stroke outboard motor. Manufacture date 03/16. More Thrust: These feisty four strokes serve up twice the thrust of comparable two strokes in the 2000-3000 RPM range. Max Muscle: Dual Thrust™ propellers (optional on T50/T60 and standard on the T25 and T9.9) redirect exhaust flow away from the propeller, reducing ventilation and increasing thrust up to 60% in forward and 70% in reverse. Award-Winning Control: Yamaha High Thrust outboards are compatible with our award-winning, Multi-Function Tiller Handle. Optional on all high thrust models, this tiller handle’s ergonomic design makes shifting easy, with less rotation needed to go from idle to wide-open throttle. This, plus a max-grip throttle handle reduces operator fatigue, so you can spend more time on the water. Max Muscle: Large-diameter, low-pitch Dual Thrust™ Propellers (optional on T50/T60 and standard on T25/T9.9) are designed specifically to harness the power of our High Thrust outboards. They redirect exhaust flow away from the propeller, reducing ventilation and increasing thrust up to 60% in forward and 70% in reverse. Maximum Overall Performance: Microcomputer Ignition adjusts timing to maintain optimum engine performance, economy and power under all conditions. Ultra-Low Emissions: Yamaha high thrust four strokes are California Air Resources Board (C.A.R.B.) Three-Star Rated for Ultra-Low Emissions and meet all federal EPA requirements. Anti-Corrosive Barrier: Yamaha’s proprietary ACP-221 Paint Process provides an extra-tough, five-layer barrier against corrosion. It’s a key component of our renowned Ultimate Corrosion Protection System (UCP-II™), which is standard on all Yamaha high thrust outboards. Ultimate Corrosion Protection: Combined with our proprietary alloy (YDC-30), our exclusive Phaze Five™ electro-deposited, anti-corrosive paint system provides a tough, five-layer barrier against corrosion. This protection is standard on all Yamaha portable four-stroke engines. Easy Engine Flushing: A Freshwater Flush Device allows you to flush the engine without starting it, for maximum convenience. Powerful 4 Cylinder 60.8 cu in. Degree of Tilt: 69 deg. Degree of Trim: -4 deg. through +20 deg.